I have been looking at the search terms that visitors have used to find this blog. “Easy stitching patterns” appears regularly. So with this in mind I have designed a Christmas pattern that should be easy for beginners to stitch. If you are not a beginner it will be good for producing quicker stitched Christmas cards. I have made an example card from the pattern and you can see it on the right. The two vertical columns of snowflakes are stitched in Kreinik confetti pink thread and the words are stitched in red thread. 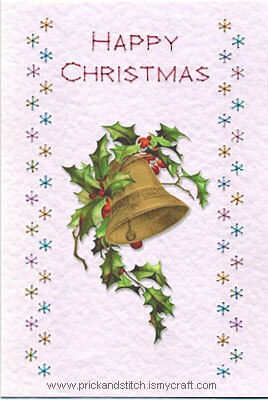 I have added some vintage Christmas clipart of bells and holly to show the possibilities. You could add 3D decoupage, tea bag folding, a photograph or whatever takes your fancy. Please let me know how you get on with this pattern by using the comment link below. If you would like to display a picture of the card that you make from it please email it to me at prickandstitch@ismycraft.com . The bells and holly clip art is copyright and is used with kind permission. It is available as a free download from www.christmasgifts.com/clipart.html. Thank you David – When I have printed this off & made one I will share it. Thanks for the patterns you share . Thank you so much for letting me see your website,it is lovely. Thank you. I’ve been looking for easy patterns. I had planned to volunteer teaching at a assisted living program. It may be a little too late to begin Christmas cards now (organizing a group, gathering materials etc) but I will file this and any other easy pattern for next year. It would be nice if we could just print the patterns and not have to print all the comments that have been made. We can read them on the computer and don’t really need to have a printed copy. I find printing them is just a waste of paper. Do you mean that you want to print the coloured picture above, Arlene? To print just the picture right-click on it and select “Print picture” from the drop down list that appears. I have now added a “Printer friendly verson of this post” link. I hope this helps.